One day, an elderly nun came to the priest of the Church of the Nativity of the Blessed Virgin in Vladykino and brought to him an icon in an icon-case. She told him he would be the rector of the Church of Iveron Icon of the Mother of God. Nine years passed, and in 1992 this priest was appointed the rector of the Church of Iveron Icon in Ordynka Street. A wooden church of St. George the Martyr «in Ordyntsy», «on the Pasture» (one of the numerous pasture grasslands of the Zamoskvorechye area) was for the first time mentioned in a document dated the year 1628. As for the stone Church of St. George on the Pasture (in Ordynka), it was built instead of the obsolete wooden church by the merchant Semion Potapov in the year 1673. In the records dated the year 1722 it already appears with the St. John the Warrior aisle. In 1788, the parish sent a petition to the ecclesiastical authorities for the extension of the Church. Apparently, the building design already existed at the moment. Three years later, the parish submitted another petition to Metropolitan Platon. Finally, the permission was obtained, and soon a new refectory with two aisles — St. John the Warrior aisle and Iveron Icon of the Mother of God aisle — was built. In the years 1798-1802 the church was rebuilt at the expense of the parishioner captain I.I. Savinov and renamed in honor of Iveron Icon of the Mother of God, with the St. George aisle and the St. John the Warrior aisle. The authorship of the new design (though uncorroborated) is attributed to the outstanding Russian architect I.V. Egotov, Chief Director of the Kremlin Drawing Expedition (Department), pupil of M.F. Kazakov. The church was built in the style of late classicism. A high, domed rotunda with two rows of windows is surrounded by four projections. The plane view of such composition represents a cross with a circle inscribed in it. The Eastern arm of the cross — the altar — has chamfered corners. The Western arm connects the rotunda with the refectory. The side projections with the loggias at the entrance are decorated with the Tuscan wall porticos consisting of two pairs of columns supporting the smooth-faced round arches. The column heads are of white stone. The original color of the building faces is pink with whitened details. The church was built within the bounds of the then existing classical tradition, in the context of such pieces of architecture of the late XVIII century as the Church of Pentecost at the Lazarevskoye Cemetery, Dormitory Church in Mogiltsy, and the refectory of the Church of Joy of All Sufferers in Ordynka. The new church was painted in the first quarter of the XIX century. The painting was renewed at the end of the century. Already by the year 1802, a single-storey stone almshouse was built at the church. Annually, up to 250 rubles were raised for the charity purposes. The rest of the church buildings were of wood. The fence along Ordynka Street on both sides of the portico, with two pairs of gates, was built from the very beginning. Later, the fence was turned round the corner and continued along the Iversky side street. Possibly, though it is not corroborated by any remaining documents, a cemetery existed at the church. In the recent years, bone fragments were found several times during the construction work performed nearby. 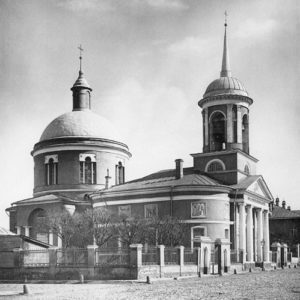 The church sustained great damage from the fire in the time of the Patriotic War of 1812. It was rebuilt and refurbished later — in the years 1842, 1885 and 1898. The most sacred thing of the church was a large miracle-working Iveron Icon of the Mother of God, painted in 1792 by Vassily Ivanov, priest of the Church of St. Nicholas the Miracle-worker «v Podkopayakh» (place where clay was dug at the foot of the hill), to whom, as the one «knowing the power of icon painting», the restoration of the ancient mural painting of the Annunciation Cathedral in the Moscow Kremlin was entrusted. The local tradition has it that this icon substituted for ten years the main miracle-working Icon of the Mother of God in the chapel at the Voskresenkiye Vorota (Resurrection Gate) in the Red Square. In the XIX century, at the request of the parish, Philaret (Drozdov), metropolitan of Moscow, donated the icon for the Iveron Church. In the 1930s, after the closure of the church, the icon was moved to the Church of St. Nickolas-in-Kuznetsy, where it is standing till now in an icon-case before the right choir of the St. Sergius aisle. Quite remarkable was its silver and gilt riza made in 1855 at the factory owned by N.V. Nemirov-Kolodkin. The Holy Mother’s crown was decorated with several hundred cut diamonds, sapphires and rubies; the towel with an exquisite pattern stud with pearls and adorned with jewels. Nikolai Nemirov-Kolodkin himself, who lived nearby and was the warden of the Iveron Church, more than once decorated it with other best products of his factory. In 1892, when the centennial of the Iveron Icon was celebrated, A.N. Druzhinin, the new church warden (the nephew of the previous one), performed, at his own expense, the building renovation and the washing and cleaning of the iconostasis, as well as encased many icons in the massive expensive and artistic rizas. Among the revered ancientries in the church there were the St. George and St. John the Warrior icons (both dated the late XVII century), as well as the icon of the Mother of God of Kazan, the icon of the Mother of God of Tikhvin, and the icon of Christ the Saviour (all dated XVIII century). Going back to the end of XVIII century were the liturgical vessels, a silver cross with holy relics, and the New Testament. Reposited as a historical monument was a large ancient cross made of zinc, possibly removed from a dome, with a long inscription narrating the story of the foundation of the church and its renaming. The church stood out from the other Zamoskvorechye churches by its beauty and the richness of the ornaments. After the October Revolution, its property was supplemented by that of the closed Church of the «Seeker of the Perishing» Icon of the Mother of God in Zatsepa Street. However, after the all-union church property seizure campaign had been unleashed, the authorities robbed it. On 6 April 1922, «the Third International’s agents» confiscated 17 poods 31 pounds (i.e., about 291 kg) of gold and silver — dozens of silver rizas and crosses decorated with jewels and other church items. They also took away the famous riza of the miracle-working Iveron Icon. In vain did the believers argue in their complaint that the number of the workers and employees of the bus depot did not exceed two hundred, while the religious community numbered over one thousand and a half people. The complaint was forwarded to VTsIK (All-Russian Central Executive Committee), which dismissed it, and soon the split-up of the remaining unpilfered church property began. To the Gokhran (State Depository for Precious Metals) the rest of the silver decorations and the liturgical vessels (about 9 kg total weight) were removed, and the museum specialists took the antique icons dated XVII-XVIII centuries. However, the major part of the church items, as it was usual in such cases, was delivered to the Mosfinotdel (Moscow City Financial Department) warehouses, where their traces were lost for good. From the various historical books we know that once served in our church «priest Potap with his sons, sextons Kondratiy and Grigoriy», «priest Martyn Filippov», and «priest Pyotr Ivanov». This historical list of priests known to us was completed by Father Pavel Antipov, who was forced to sign in the year 1929 the «Deed of conveyance of the church property to the Admotdel…» (that is, to the Moscow City Administrative Department). «The property proved to be in good order, — the Deed ran, — and was accepted … and the keys were accepted as well». In the period of the use of the church building as the VARZ Works club-house (1929-1989) it suffered severe damage: upper tiers were disassembled; columns of the upper windows were removed; Western portico column heads fell off; building face painting was destroyed; the rotunda dome was disassembled; and an extension was made to the Southern face of the refectory. The fence and the almshouse were pulled down. The mural painting inside the church was painted over. In the 1930s, intermediate floors were built. Fortunately, the building itself, nevertheless, survived. In 1989, the church building was transferred to the «Art Moderne» modern art picture gallery. Having received the church premises at their disposal, the artists repaired its interior slightly and designed it as an exhibition hall. Meanwhile, in 1993, the new rector of the church had in his hands the Order of the Government of Moscow on the transfer of the church building at the disposal of the parish, and that very Iveron Icon of the Mother of God presented to him nine years before. However, he was able to enter his church only having bought a ticket to the exhibition of the «Art Moderne». The artists were not going to quit the premises. But, with God’s help, after the long court proceedings, on 12 July 1994, the church building was really transferred at the disposal of the parish. On 29 December same year, the church was consecrated, and the services began. Currently, the divine service is administered so far only in one aisle — the right one, i.e., St. George the Martyr aisle. Since 1994, the parish managed, by its own efforts, to completely restore the belfry. At Christmas of the year 2000, seventy years after the church had been closed, the voices of the six bells of the Iveron Church started ringing festively over the Ordynka. Since 2001, with the blessing of His Holiness Alexis II, Patriarch of Moscow and All Russia, the clergy of the parish spiritually guide and follow up the personnel of the military element of the Federal Agency for Government Communications and Information under the President of the Russian Federation (FAGCI), based next to the church. And the FAGCI officers assist in the renovation and restoration of the church. Owing to the assistance provided by the individual parishioners and some benefactor organizations, all the church has been covered with a copper roof and the rotunda windows have been glazed anew. Currently, the rotunda interior restoration is underway, and its dome has been painted already. The design of the new large iconostasis has been prepared. With God’s help, about the same set of icons is gradually being collected as it had been before the church was closed. As before, there is the icon of the Mother of God of Tikhvin and the icon of the Mother of God of Kazan in the church, both dated the late XIX century. The icon of «Joy of All Sufferers» dates back to the turn of the XVII and XVIII centuries. Several icons belong to the contemporary Moscow school. There is a new two-tier iconostasis. Two icons — icon of St. George the Martyr and icon of St. Panteleimon the Martyr and Healer are with fragments of holy relics. In 1998, fragments of relics of the Kiev-Pechersk holy fathers of the Near and Far caves were donated to the church from the Kiev-Pechersk Lavra, as well as the relics of several other saints, among which there is a fragment of the relics of Archbishop Luke (Voyno-Yasenetsky). They are kept in a carved shrine standing to the right of the altar and are open permanently. But the most sacred thing of the church was and is remaining the Iveron Icon of the Mother of God. According to the old tradition, our Dedication day is in the Bright Week. Each Sunday evening acaphistus is sung before the Iveron Icon decorated by the parishioners. On weekdays and on every Sunday the Liturgy starts at 9 a.m.
On Wednesdays, if there is no vesper’s service, a public prayer is administered before the icon of the Mother of God «The Unending Chalice» with the blessing of the water, for the curing of those suffering the drinking and drug addiction affliction. Our church is located not far from the «Tretyakovskaya» Metro station; it is also possible to walk from the «Polyanka» Metro station. Address of the church: 39, Bolshaya Ordynka Street, Moscow, 109117. We shall always be glad to see you in our church.